Firing a gun is fun. The same cannot be said about preparing your rifle brass. Prepping, sizing, cleaning and trimming your rifle brass can be time consuming and boring. Thankfully, the Best Case Prep Centers exist to make work easier. A good prep center speeds up your case preparation process allowing to get back to more exciting things. With this in mind, it might be time to break open your piggy bank to buy a case prep center. And this guide will help you sort out the various prep center options available. In addition, in this guide, I have compiled a list of 5 of the best prep centers, as well as a comparison chart. Quality does not come cheap. This is especially true when shopping for a prep center. Therefore, there are several things to consider before spending your hard earned cash on a prep center. Below are the main things to consider. Prep centers come with all kinds of attachments and tools from chamfer tools to neck brushes and pocket cleaners. Needless to say, the more the tools and attachments the better the center. However, just because a prep center has numerous tools does not mean its ideal for you. Spending money on a center with additional tools that you will never use makes zero sense. There are two main types of prep centers; manual and electric prep centers. Manual prep centers are operated by hand and make use of a hand-held crank. Electric centers are motorized machines that use electricity. Ideally, if you prep a few rifle cases once in a while a manual prep center is not a bad choice. However, if you want to produce a huge number of cases then an electric prep center will be a better choice. How powerful a prep center is determined, how efficient it is. If your prep center lacks the power to produce the number of cases you need then it is of no help. These machines are operated by a motor. A motor with a high torque is preferred. Case prep centers are not the lightest or most compact appliances out there. Nevertheless, size does matter when shopping for one. It is true that the more powerful a prep center is the larger and heavier it is. All the same, it is important to strike a balance between power and size. For domestic use a medium sized center is ideal. Spending thousands of dollars on something you do not need is unwise. When shopping for a prep center it is important to consider your budget. This will help you know what kind of center is available to you. The most expensive prep centers are usually the heaviest, and most powerful. However, not everyone needs a heavy-reloading prep center. In a nut shell the best case prep center for the money is the one you can afford and meets your needs. 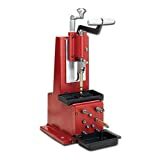 You may need the best progressive reloading press or the best reloading scale for complementing the prep case centers. So, Always stick to what you can afford and what can serve your reloading needs. Unassuming is the word I would use to describe the Lyman 6702203 case prep Xpress. On the outside, it does not look like it has a lot going on. It is until you use it that you begin to appreciate just how valuable this Lyman case prep center can be. Simplicity is what this prep center is built on. However, this is not to say that its performance is simplistic. It comes with a deburr and chamfer tool, which I absolutely love. With this tool, I am able to remove excess brass from trimmed cases. The best thing about it is that it is built for virtually all cases from .17 to .45 caliber cases. Another awesome feature of this case prep is the primer pocket cleaner. The latter comes in handy when you need to get rid of fouling from the primer pocket. This combined with the reamer tools also help remove military crimps and rough metal edges. Uniform primer depth is essential for achieving accuracy and consistent ignition. It is for this reason that Lyman throws in a Primer Pocket uniformer. 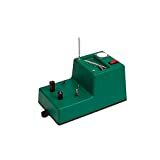 This precision tool allows you to set the depth of your primer whether for large rifle brass or for small rifle brass. The great thing about this prep center is that it can be used to perform five separate functions simultaneously. This saves on time and helps you do more. If you are like and reload groups of 50 rounds per session, then this is Lyman case prep center is one you will find useful. It is moderately priced but comes with all the tools you would expect from a premium quality prep center. In a nutshell, it is the best case prep center for reloading more than 50 cases at a go. At first glance, the Frankford Arsenal Platinum Series case trim and prep system is noticeably bulkier than the Lyman. However, it is still a fantastic piece of machinery. One of the main reasons the Frankford Arsenal is heavier than most prep centers is the materials used to build it. Unlike its Layman counterpart, which is built from plastic, this one is built from a combination of aluminum and steel. Thus, you can expect it to last longer than most of its competitors. To prep, your casing all you have to do is insert it into the main collet. The latter securely holds the case without damaging it. The inside HSS cutters make trimming the case to your desired length easy. On top of the prep center is a storage box where several components are stored. Inside this storage case, you will find spare collets and bushings. Also, there are other tools that you might find useful. There are two different sized primer pocket cleaners a large and a small. This means you can reload a variety of cases. From a .17 Remington to a .460 Weatherby. Compared to other prep centers this machine from Frank Arsenal is more of a trimmer than a prep center. Nonetheless, it has a lot of features that you will find useful. Overall, this trimmer is built for long-term usage and will not break down easily. The cutters are also of very good quality. Unlike its other two previous counterparts on this list, the Hornady 050140 is a manual case trimmer. Now, this, not a bad thing as there are a lot of benefits to using manual trimmers. In this regard, this case trimmer can be a valuable purchase and here is why. Being a product from Hornady the 050140 cam lock case trimmer uses the manufacturer’s standard shell holders and pilots. As such, you can use this trimmer on a variety of rounds including both rifle and handgun rounds. The adjustable micro-cutting head is an improvement from the 050140’s predecessor. This cutting head allows for precision cutting of cases. With it, you can adjust the length of your cut for different cases from the .22 caliber case to the .7mm caliber case. For a manual trimmer, this Hornady trimmer is easy to use. Turning the cam lock locks your case securely in place. To release the case all you need to do is to release it. It is a light and compact trimmer that you can even mount on a desk. Moreover, weighing 3 pounds you can move it around when you need to. And best of all it does not produce any noise. A cost-effective alternative to the pricier electric trimmers and prep centers, this trimmer is an easy to use tool. Furthermore, it has a lot of useful features that you will appreciate. It is arguably the best case prep machine for those looking for a manual trimmer. When talking about the Best Case Prep Centers, the RCBS 90375 Trim mate prep center can never go unmentioned. This little green box like prep center can do more than it looks. It is one of those prep centers that just oozes quality. This prep center can be used both for trimming and prepping your cases. The trimming is done by the small and medium-sized case neck brushes. These brushes are versatile enough for trimming different cases. The best case prep machine comes with both deburring and chamfer tools, and the 90375 is no exception. These tools allow for easy cleaning of your cases and refining. Another feature that characterizes the best case prep machine is the ability to accommodate more accessories. This rcbs case prep center has this and can be used to prep .50 Beowulf cases. This prep center has five rotating heads meaning you can do five things at once with it. In addition to the five heads, there are two stationary heads. These you can use to add case brushes. For a prep center of its size, this RCBS tools does quite a lot. It can chamfer, trim and clean your rifle brass. Also, it is made from high-quality materials, which is why despite its size it is relatively heavier than some of its competitors. This is the perfect option for anyone looking for a compact do it all prep center. The larger than life Hornady 050012 combines a prep center with a powerful trimmer. And as its name suggests this reloading case prep station will have you ready to lock-n-load in no time. Larger than most of its competitors, this Hornady case prep center is a great piece of machinery. For a prep center of its size, you would be forgiven of thinking that it lacks a micro-adjustable trimmer. However, this trimmer/prep center has a trimmer that you can adjust up to .001 inches. This allows for accurate and more consistent trimming. This is not your everyday case prep center thanks to its powerful motor. The lock-n-load prep cent can do a lot of heavy duty work. On top of that, the motor is housed within a durable casing made from high-quality materials. While it is a motorized case prep center is does feature a grip handle. This handle makes it easy to hold the prep center. You will not experience any fatigue when using it thanks to this grip handle. This prep center excels at removing shavings and diverting them into its removable trays. Therefore, the shavings are kept outside the case. Better yet, the trays are removable and can accommodate a decent amount of shavings. When it comes to the best case prep center for reloading it does not come any better than the Hornady Lock-n-Load. This heavy-duty prep center is built for heavy-duty work. However, this is not at the expense of its ease of use or comfort. As it is easy to use and offers a grip handle for comfortable usage. There is a so much time you can save in your brass prepping process by having the Best Case Prep Centers. However, not every case prep center out there will be good for you. Finding the right prep center for your needs is crucial. Otherwise, you will end up with a prep center that does not do what you want it to do. Alternatively, you can end up with a prep center that does more than you need. Overall, it is wise to invest in a prep center that fits your specific needs. The prep centers on my list fit the needs of different people.